I thought it might be fun to spend some time and space sharing childhood memories with you occasionally. Read on, if you're interested in this kind of story. One of these days, I'll scrapbook this story. I don't know of any photos of me playing with these toys, but I could always use one of the photos I snagged online about the toys themselves. Be gentle when reading and commenting - I'm writing this a bit stream-of-consciously. Maybe you'll even be inspired to share a childhood memory of your own either on your blog or in your scrapbook. 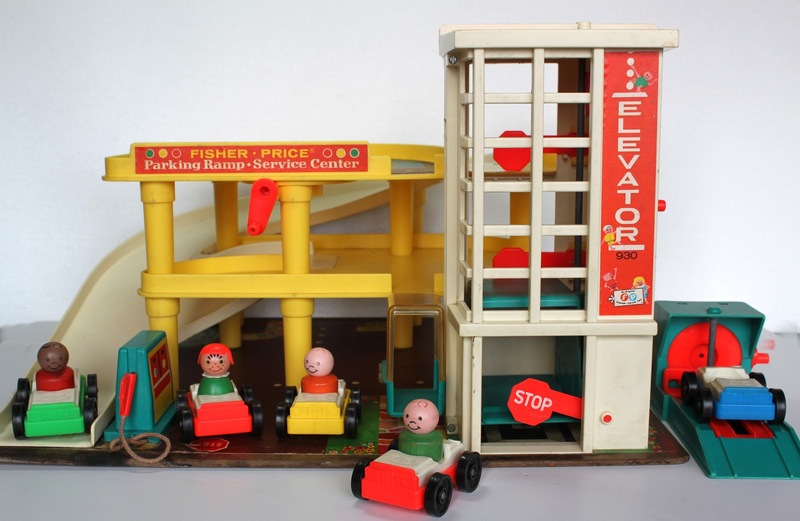 When I was a little girl, I loved played with Fisher Price weebles. Do y'all remember those? "Weebles wobble, but they don't fall down." I was obsessed with those little figures. 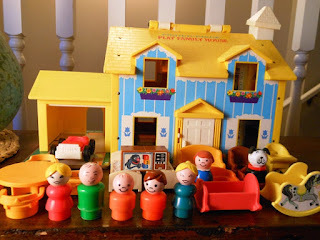 Before I played with Barbies, I was all about the weebles or the Little People. (Are those the same brand or are they similar products in two brands? Idk - I use the term weeble interchangeably.) If you don't remember these, they were wooden people with rounded bottoms (sort of like spools of thread) that wore painted clothes. They were great for small children because they were virtually indestructible. I'd spend hours playing with those figures and imagining whole lives for them. My grandparents owned a real estate company when I was about 5, and my mother and aunt worked there as well. The office was in an old A-frame house in 'town,' and had an upstairs area that had originally been a couple of bedrooms and a loft. Since they spent a lot of time there, they'd furnished one of the bedrooms in case someone needed a rest and the other bedroom was used as storage for signs and other real estate paraphernalia. The loft area? Well, it was my domain. After my mother picked me up from school, (At age 5, I went to private kindergarten - no public kindergarten back in the day. Before that, I attended preschool.) we'd stop somewhere for an after-school snack and then head to the real estate office. She often had showings to make in the late afternoon or early evening or even paperwork to complete, so I'd hang out in the upstairs area and play. I hardly ever had any homework in kindergarten because I already knew how to read. That meant that I'd come home and have the rest of the night to play. This would've been circa 1976 or so, and I can vividly remember the green shag carpet on the floor and the mustard gold furniture that the office sported in those days. Downstairs, my family would be on the telephone or writing up paperwork or heading out to meet with a client. Upstairs, I was in my own little imaginary world. Sometimes, I'd get in big trouble because they'd yell and yell for me when it was time to leave. I wouldn't hear them because I'd be off in a magical world of my own invention. I'd be acting out scenes with my wooden people, talking in different voices, and creating whole imaginary worlds. It was like Sim City in the olden days; this was my universe of Little People that I created. 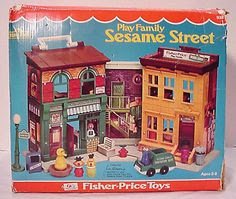 I had several different Little People houses that I'd set up in various areas of the loft and create a kind of village. I remember having a Pizza Hut building that looked just like the local pizza restaurant in town. The worker weebles even wore the same kinds of uniforms as they did in real life and had counters and ovens just like the real restaurant! For some reason, I can't find a photo of the Pizza Hut set; boy, I wish I'd had this McDonald's set though. I also had the Little People set for the farm complete with the farmer's family and a menagerie of barnyard animals. When you opened the door to the barn, a cow mooed. 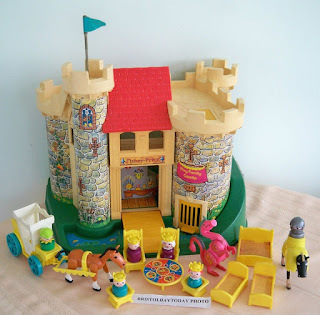 There was also a castle that was part of my collection; it included a king and queen, a knight, a princess, a horse, and a moat that actually raised and lowered. For each holiday or special treat, I'd ask my mother to add to my collection at every opportunity. 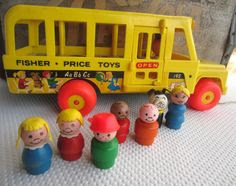 I can remember owning a school bus filled with children and singing the "Wheels on the Bus" song as I played with it. 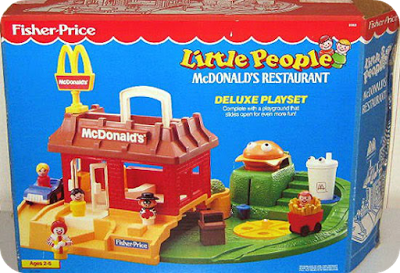 I can remember owning a park playset that had a seesaw, a merry-go-round, and a swingset. There were all kinds of child figures in every color and nationality; it was kind of progressive in that way I guess. I vaguely recall a camper van, but I can't be sure that was for Little People; I may be remembering a Barbie moment there. Likewise, I may have had a set of construction workers and a building site or garage or maybe that was just a set that I wanted. It seems like an odd request for such a girly girl, but it would've made a good addition to my village. Another vague recollection centers around a treehouse that sort of looked like the Keebler Elf tree, but I can't be sure my memory is reliable there either. I imagined having a Sesame Street set complete with Kermit and Big Bird and Bert/Ernie, but I'm pretty sure that wasn't real. I was so imaginative that the line between fantasy and reality blurs for me in my childhood. The 'baby' weeble was definitely my favorite. She was smaller than the others and rounder and had a painted curl in the middle of her bald head. She wore a white painted outfit with a yellow painted bib that had a scalloped lace edge. Her face was round and sweet with pink cheeks and blue eyes. (Is this photo wrong or is my memory unreliable?) She looked nothing like me, but I loved that baby and pretended that she was mine. Or that I was her when I was a baby. Or that she was my sister. In fact, I loved her so much that I often carried her around in my fist as I went about my business the rest of the day. More than once, my mom confiscated the baby weeble on the way to school because she was afraid that I'd lose her. More than once, I snuck her into school in my sweaty, clenched fist and kept her hidden in my desk all day, touching her for reassurance that she hadn't disappeared somehow. More than once, I fell asleep clutching my baby doll in one hand and my baby weeble in the other. I wish that I at least had photos of those toys, especially of me playing with them. I wish I had photos of my village all spread out in the loft area of that upstairs. I wish there were photos of my mom and the rest of my family that I vividly recall from that time period. 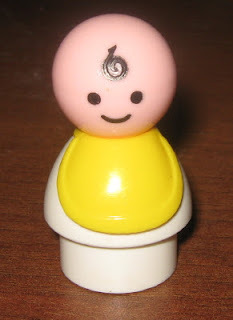 I'd give anything of a photo of that baby weeble clutched in my sweaty, little hand. Years ago, there was a photo of me wearing a blue velvet dress, white tights that had dirty knees, cowboy boots, and a cowboy hat that was taken as I posed in front of a white flocked Christmas tree in the lobby of that office. I'd love to find that photo today and use it to tell this story. In the meantime, I'll make do with images I snag from the internet and the memories. The memories are most important, after all. Wanted to add, what great vivid memories you've written down here. I wish you had those photos, too. It was so different in the days of film. Now we have so many photos we don't know what to do with them. I loved Little People too! I had the castle, airport, school and house. My favorite was the castle and the dragon. I would love to have one of those dragons again! I have one photo of me with my Little People sets and its a treasure. I also had the treehouse you have pictured. The domed canopy went up and down and I think it had a slide. Thanks for the memories! I collect Fisher Price Little People. I'm looking for a bride right now. Weebles are definitely Hasbro and looked much different. My eldest son had a bunch of Fisher Price sets and most of the people were wood from the first sets and now they are all plastic. 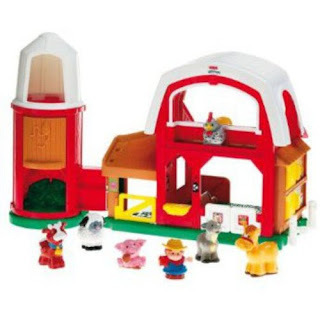 I even have the pig and chicken from that first set. Thanks for sharing our Little People love. Oh thank you for this walk down memory lane <3 I had that house and I think the garage station I loved loved loved my treehouse. Loved it. I sure do miss my weebles and my little people. 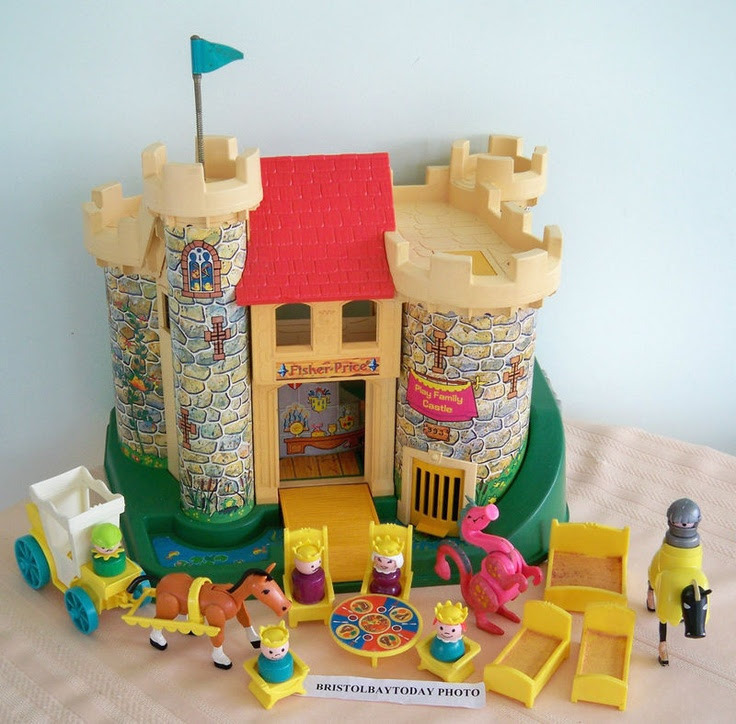 we still have the castle - it's been through my 3 kids and now my 5 grandchildren. It was almost always the first thing they'd ask for when coming to visit. In the beginning, it was in habited by Little People but now it's usually the home base of a multitude of Disney small figures. For us, it really is a family heirloom.